Last week in Ankara, a DPI representative and a member of the Advisory Board together with other members of the Turkey Democracy Platform (TDP met with the President of Turkey, Mr. Recep Tayyip Erdoğan. 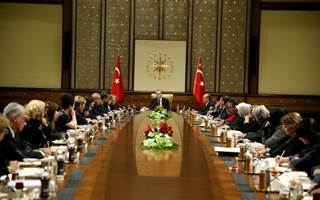 At this high-level meeting, the DPI representatives briefed President Erdoğan in relation to DPI’s work, such as the numerous activities in support of peace, including round tables and comparative study visits to, among others, Colombia, Ireland, South Africa, Philippines carried out with the generous support of our donors. The President was informed that on the night of the attempted coup, DPI was holding a meeting in Ankara with a delegation of female MPs representing the AK, CHP and HDP parties, one of the Presidential Chief Advisers and two speakers from Ireland. The decision of the participants, to continue with the meeting despite the extraordinary circumstances, was commended by the President as showing determination.